Oh my goodness. 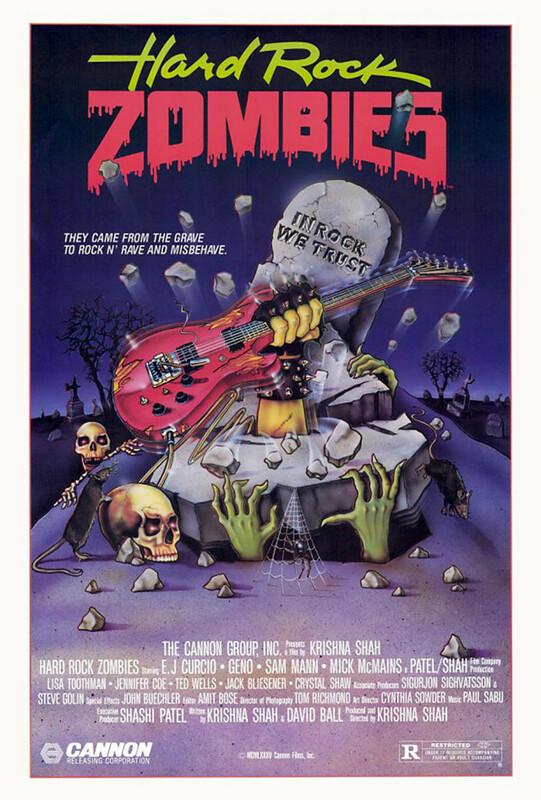 If I could remake any movie that I wanted to, I would choose to remake Hard Rock zombies. This thing is pretty wild. The movie follows the exploits of what we are supposed to accept is a talented, up and coming hard rock band. Of course, just look at them and you’ll see immediately that our main characters are actually a profoundly lackluster 80’s pop metal band with no future at all. The band (Do they even have a name?) 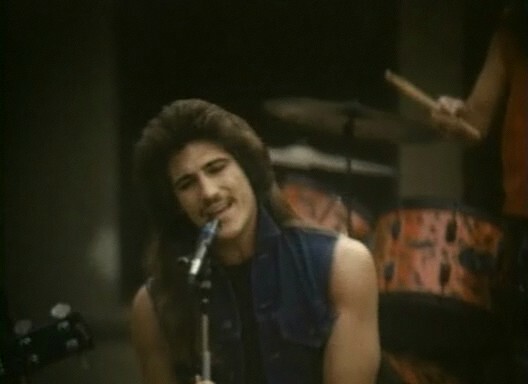 is fronted by a dude who looks like Frank Zappa’s Turkish stunt double, and he rocks about as hard as Neil Diamond’s mom. This doesn’t really matter, though. The movie is bonkers. So, our guys pull their gross van into a backwoods town somewhere where they are inexplicably scheduled to play a show, and they then proceed to get down to the business of cutting loose- hard. Apparently, they compensate for their lack of a street team by spreading word of mouth via their too-cool-for-school attitude. Naturally, the eleven people in town under the age of 65 love it, and the remainder of the town’s populace grumps their asses off until they can’t stand it anymore, at which point our guys are jailed and told to leave town asap. Who booked these guys here and why? Never fear, however, our band (Let’s call them Stink) is next invited to bunk at a nearby mansion, where they can finally count on a little American, Small Town Hospitality. Hospitality administered by who else, but Hitler, who secretly lives here with his weird, freak children, and a now Werewolf-ized Eva Braun. No idea why this is part of Hard Rock Zombies, but that’s all in there. Naturally, Hitler and co. have taken in our friends with the intention of murdering them, which they do, but not before Turkish Frank Zappa (his real name escapes me, I promise it’s not important) begins laying ground work with a local girl who is clearly super, super under age, and creepily gives her a cassette tape to play in the event of their demise. What great timing! The cassette tape contains a recording of a bass riff based upon the mad writings of Abdul Alhazred or something, and apparently brings people back from the dead. So, our hard rocking band of gross losers and potential statutory rapists returns from the dead to groove off in the direction of Casa De Hitler for revenge, and I’m serious when I describe their method of locomotion as “grooving.” Afterwards, they go right back to trying to make it as a crappy 80’s rock band, leavings Noweheresville, USA infested with murderous zombies, including a now Zombified Hitler. The townsfolk then go about the task of trying to rid themselves of the undead, mostly in pretty wacky ways. Around this time I realized the movie was supposed to be funny, which is always a let down. How the movie ends is something I have chosen to keep to myself, even though I’ve already spilled the beans on 99% of the movie without so much as a “spoiler alert,” but what you need to know is this; Hard Rock Zombies is freaking nuts. It’s really, really crappy, and the funniest parts of the movie are inadvertent. Getting your hands on a copy is easy, but the DVD currently in circulation has a pretty shabby print, which leaves the third act of the film a murky, dark mess of visual confusion. Who knows, maybe it was shot that way, or perhaps it’s some kind of day-for-night shooting gone horribly over-board. Anyway, the movie deserves a better release, but I recommend people watch it, because it’s pretty funny.